The global synthetic diamonds market has several players. In the last few years, sensing potential, many new players have entered the market. New-age technology has allowed many new and established players to introduce innovative designs and products. Established players too are introducing their own product lines of synthetic diamonds to attract consumers. With wide range of products, companies are able to expand their customer base. Some key players in the global synthetic diamonds market are New diamond Technology LLC, Henan Huanghe Whirlwind, Element Six, and Heyaru Group. Global players are competing with regional players and local vendors. This will bring new designs and innovations in the global synthetic diamonds market. 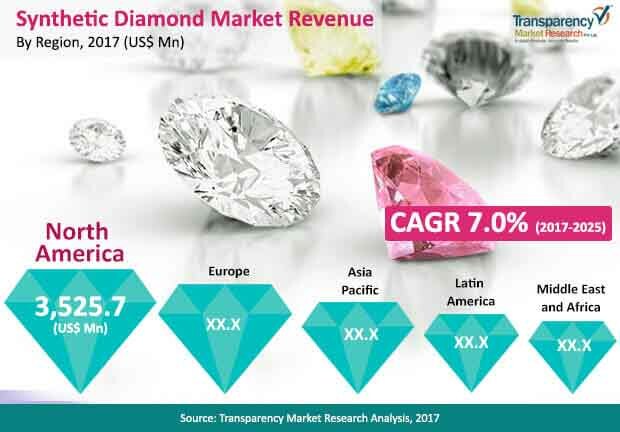 According to a Transparency Market Research report, the global synthetic diamonds market was valued at US$ 16.04 billion in 2016. It is predicted to grow at CAGR 7% between 2017 and 2025, and is expected to reach US$ 29.15 billion. Geographically, Asia Pacific led the global synthetic diamonds market with 45% share in 2016. The trend is expected to continue in the coming years. The growing demand from developing economies like India, Japan, and China are driving the demand in this region. North America, Europe, the Middle East, and Africa will also hold significant shares in the global synthetic diamonds market. Application-wise, several properties of synthetic diamonds drive its demand in various industries. The unique combination of mechanical, acoustic, electrical, thermal, optical, and electrochemical properties have enabled several applications. Technological advancements will also help identify more applications for synthetic diamonds, boosting the demand in the market. Synthetic diamonds possess similar properties of a diamond. Hence, they replace diamonds in most industries. They are used to create computer chips. Besides, they are used in mining, machine production, construction, medical procedures, space science, experimental physics, stone cutting and cleaning, and electronics. Moreover, they are also used in gas and oil drills, as no other material possesses such hardness. Besides, synthetic diamonds are also used to treat industrial and household water. Gem quality is of utmost importance for purchasers in India. Hence, jewelers are particular about procuring high quality diamonds. Synthetic diamonds possess higher purity. On the other hand, many countries are identifying innovative applications of synthetic diamond. Extremely thing CVD diamond plates are being manufactured today, and they can be of high importance to manufacture electronics. These factors are expected to propel the global synthetic diamonds market. Manufacturing synthetic diamonds is a complex process. While there are different methods identified, most of them require high temperature and high pressure. It also involves the use of chemicals and produces high noise in some cases. These complicated procedures could restrict interest among companies in the market. On the other hand, the low awareness levels among people is also a challenge. Synthetic diamonds have recently entered the market. People are slowly gaining awareness about the product in developed and developing countries. However, a large section of the market is still unaware about its wide range of properties and applications. This could challenge growth in the global synthetic diamonds market.